Kao and his wife were said to be walking down a residential street in Long Beach along with their daughter when the woman approached them and made racist remarks against them. Kao assured the woman that both him and his wife were born the United States. 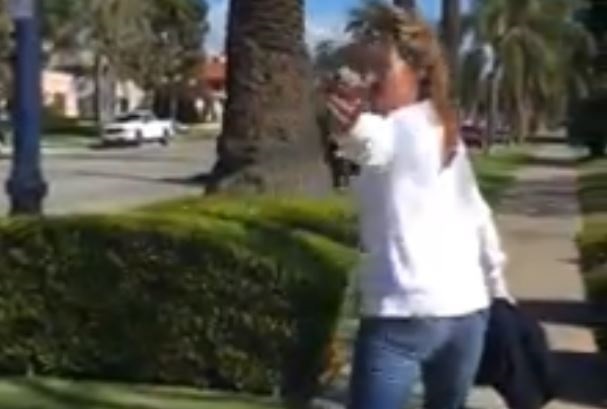 Many online users recognized the woman in the video to be Tarin Frances Olson, a psychology professor at Golden West College since 1991, which school officials confirmed. “Golden West College takes all of the recent concerns and comments expressed by members of our community very seriously. The recent video posted online of a faculty member’s comments in public are extremely disappointing and do not reflect the values or mission of the College. We expect that our faculty and staff adhere to the District’s ‘Board Policy 3050 – Code of Professional Ethics’, which requires that the conduct of employees, as ‘public employees’, shall be worthy of the respect and confidence of the community the District serves. Employees should, therefore, avoid conduct which is in violation of the public trust or which creates a justifiable impression among the community that such trust is being violated. We deeply regret that the words expressed were painful and hurtful to our students and all of the supportive members of our community. Mayor Robert Garcia tweeted Monday afternoon that he was disgusted by these racist remarks and that he communicated with Mr. Kao to assure him that Long Beach supports him and his family. Some people online called for Olson’s firing in response to the college’s statement. Aand as an educator, I can say without a doubt in my mind that a person who holds these kinds of attitudes towards people of color does not belong in the teaching profession. If you think such vile things about people in general, you cannot be an effective teacher. The incident took place around the same time a Florida middle school social studies teacher was removed from the classroom for allegedly hosting a white supremacist podcast, sharing anti-Semitic conspiracy theories and suggesting that Muslims be eradicated from the planet, according to the Huffington Post. The former teacher boasted about bringing her white nationalist beliefs into her middle school classroom, and talked about how she hid her beliefs from school administrators, the online publication reported. This is not the first time a local educator has come under fire for discriminatory beliefs. Former Cal State Long Beach professor Kevin MacDonald is best known for his controversial application of evolutionary psychology to characterize Jewish behavior and is the current editor of the Occidental Observer which covers “white identity, white interests, and the culture of the West”. He was a professor at Cal State Long Beach from 1985 to fall 2014. MacDonald believed that his personal political and philosophical beliefs don’t belong in the classroom. However, students who confronted and eventually boycotted his classroom, felt that such beliefs are impossible to untangle from educational endeavors.